DISCLAIMER: ALL TRICKS AND MODIFICATIONS SHOWN ON THIS WEBSITE SHOULD BE PERFORMED AT YOUR OWN RISK. THE AUTHOR OF THIS SITE WILL NOT BE HELD RESPONSIBLE FOR DAMAGES TO PERSON OR PROPERTY DUE TO INFORMATION FOUND WITHIN THESE PAGES. 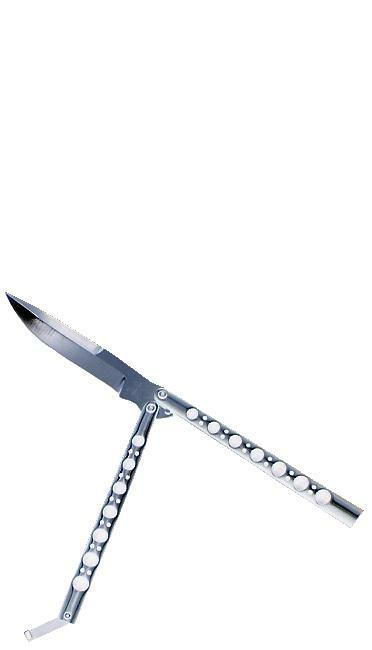 Hello and welcome to my balisong (butterfly knife) page. Please use the links on the left to navigate through the site. If the links don't show up and you are using Microsoft Internet Explorer 5.5, you can download the latest version of Microsoft's Virtual Machine here which should solve your problems.